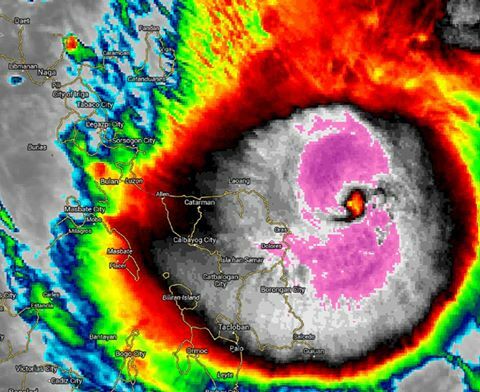 Strong typhoon Nona (Melor) to hit Visayas and Luzon this December 14, 2015. Typhoon Nona intensifies more which now has over 185kph of gustiness and wind of 150 kph. Northern Samar and Bicol Region is now on high alert due to the typhoon. Keep following this blog for more updates. TYPHOON “NONA” HAS MAINTAINED ITS STRENGTH AS IT CONTINUES TO THREATEN SAMAR-SORSOGON AREA. • Estimated rainfall amount is from heavy to at times intense within the 300 km diameter of the typhoon. • Flashfloods and Landslides is expected over areas under signal # 2 and 3. • Expected to pass very close to Northern Samar by early afternoon today. • Will make landfall over Sorsogon early tonight then cross Albay Province towards Burias Island. • Storm surges of up to 4 meters are possible over the areas under PSWS #2 and #3. Location of eye/center: At 4:00 AM today, the eye of Typhoon “NONA” was located based on all available data including Guiuan Radar at 205 km East of Catarman, Northern Samar (12.5°N, 126.5°E). Strength: Maximum sustained winds of 150 kph near the center and gustiness of up to 185 kph. Forecast Movement: Forecast to move West at 17 kph. • Houses of medium strength materials (old, timber or mixed timber-CHB structures, usually with G.I. roofing’s); some warehouses or bodega-type structures are unroofed. • There may be widespread disruption of electrical power and communication services. • Dwarf-type or hybrid coconut trees are tilted or downed. • Damage to shrubbery and trees with foliage blown off; some large trees blown down. • Unshielded, old dilapidated schoolhouses, makeshift shanties, and other structures of light materials are partially damaged or unroofed. • A number of nipa and cogon houses may be partially or totally unroofed. • Some old galvanized iron (G.I.) roofs may be peeled or blown off. • Some wooden, old electric posts are tilted or downed. • Considerable damage to shrubbery and trees with some heavy-foliaged trees blown down. • Twigs of small trees may be broken. • Rice crops, however, may suffer significant damage when it is in its flowering stage.